For the last few years, Chicago-based cartoonist Anya Davidson has quietly been making waves in alternative comics circles. 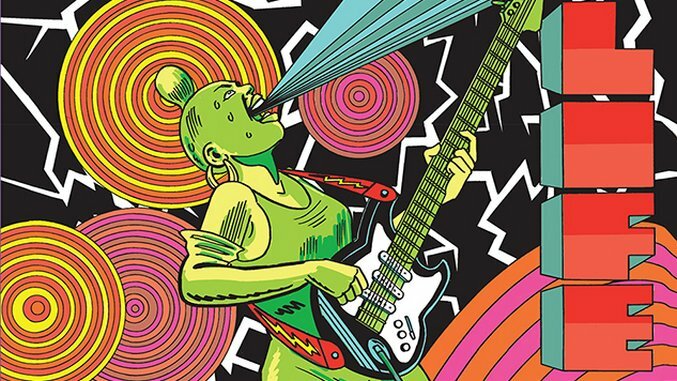 Her work, which evokes the bombastic action of Jack Kirby as immediately as it does a riot grrrl zine, is bold and brash. Her bulky, blocky figures clash and collide with one another in a cacophony of pen and ink. 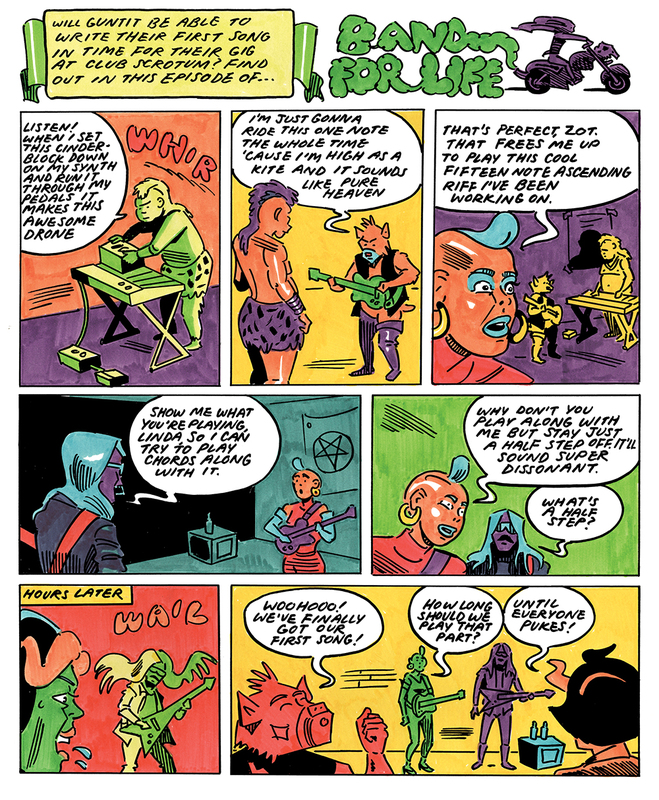 It’s the kind of genre-busting, high- and low-culture-blending comic perfectly at home in a post-Fort Thunder alternative comics scene, and for those in the know, Davidson has been a cartoonist to follow. 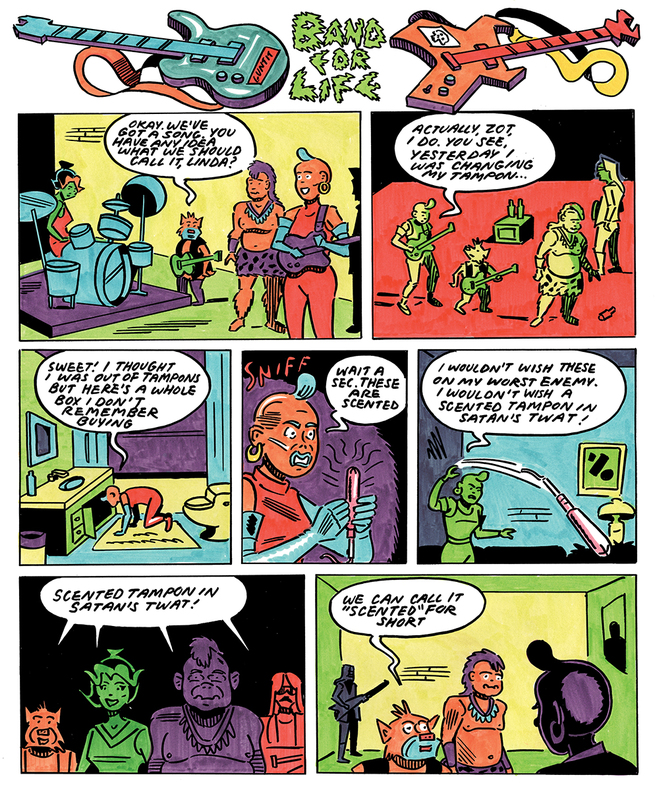 Her first book-length work, School Spirit, was published by the legendary PictureBox back in 2013, and her most recent work, Band for Life, was released by Fantagraphics in comic stores last week before its bookstore debut next week. Paste exchanged a few emails with Davidson to discuss the upcoming graphic novel, covering everything from the book’s beginning to her recent work as a comics critic. Paste: To start with: can you tell me a little about where Band for Life came from? Anya Davidson: I was in two different bands throughout my 20s. I was the singer (I screamed—there was no singing) in a band called Coughs for six years, starting when I was about 18. That band was hugely formative for me. After Coughs broke up, I played guitar and screamed in a band called Cacaw for a few years. And I’m doing the same thing in a new band now with some amazing dudes, a couple of whom are also cartoonists and illustrators. We’re trying to decide on a name. Maybe Lilac? I wanted Old Hag but the dudes shot it down. Most (pretty much all) stories about artists and musicians start with the artist struggling, and then show their meteoric rise to fame and then, often, their tragic decline. None of the bands I’ve been in were ever going to be huge. We were too noisy, too weird. We were making music for our friends, and for the experience of working together, recording, touring, just spending time with each other. I wasn’t seeing any stories about creative people who just do what they do, year after year, and just keep plugging away under the radar. I wanted to examine that—being creative for the love of it. And I wanted an outlet to cope with my feelings of fear about getting older and never wanting any of the things adults are supposed to want. I heard that VICE wanted weekly comics and I’ve always idolized dudes who could knock out weekly strips—I wanted that challenge. So that’s why it took that form. Paste: Was this something you approached VICE with? Davidson: Working with VICE was a Faustian bargain and honestly the less said about it the better. I hate to be cryptic, but I just don’t want to get too deep into that. I have to acknowledge that more people saw my work because of them, and I can’t deny I wanted people to see my work. Paste: I know that they did stop serializing it, though, and then you kept up with it on your Tumblr. Why did you keep up with the strip like that? Or, let me rephrase: what about the strip compelled you to continue it past a point where, I think, many people would’ve shelved it? Davidson: I can’t imagine who would shelve their own project because it wasn’t getting enough clicks to sell advertising to Hot Topic or BP or whoever. That person would have to be severely lacking self-confidence. I make comics from a place of desperate, personal need. If I went down the laundry list of disappointments and setbacks I’ve experienced as an artist, it would take all day. It’s never stopped me from making the work I want to make. I’m not laboring under any kind of illusion that I’m a misunderstood genius or that people don’t “get” my work. My comics are meant to entertain. But I do understand that they’re not for everyone. And that’s fine. The end goal is not about money. The people who do enjoy them let me know, so I don’t feel alone or alienated. It’s pretty meta because the strip is about artists making art for a small audience, and the joys and setbacks they encounter, and their inability to do anything else with their lives. So it gave me an outlet to express the frustrations and disappointments I encountered in real time. And I love my characters so much. Not because I think I’m a great artist, but because I drew life into their little bodies and gave them personalities and worked really hard to understand who they were. 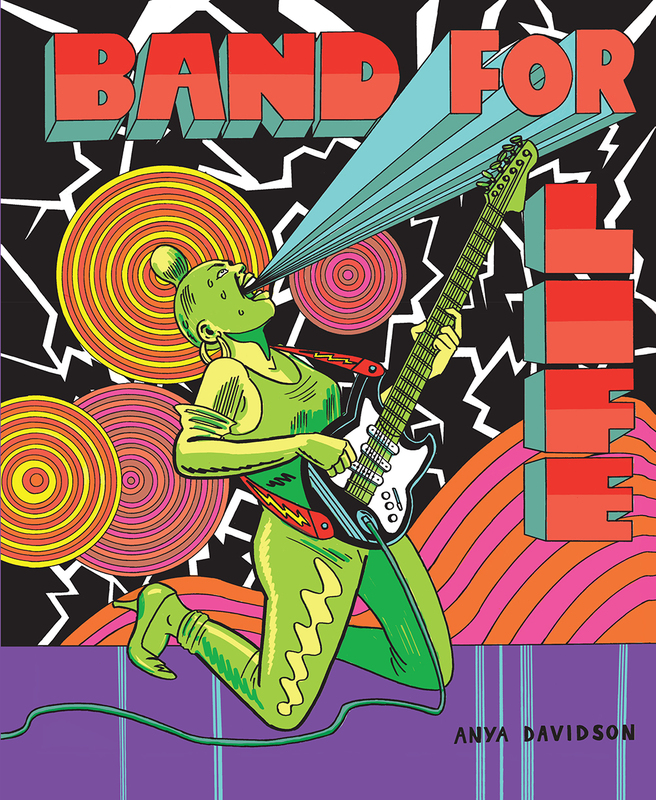 Also—and this is important to mention—by the time VICE dropped it, Fantagraphics had already agreed to publish Band for Life, and they maintained their support the whole time. At that point there was no signed contract, so they could have backed off, but Eric Reynolds, my editor, was very encouraging, which meant a lot to me. I’ve always had tremendous respect and admiration for Fantagraphics and the artists they publish, and it was a dream of mine to work with them. So that gave me courage, too. In my years as an artist, throughout the setbacks, I’ve always been buoyed by so much support from friends and editors. I feel really lucky that way, and it’s helped to keep me going. Paste: I think that love for your characters really shows in the work. A lot of these characters—and it was what really struck me about School Spirit, which was the first work of yours that I encountered—already feel distinct and fully formed when you first meet them. I’d be curious to know more about your process, especially for something serialized like this. How much do you plan, how much just comes from working with them for a few strips, etc.? Davidson: I had a story arc for Band for Life, but I wrote the strips week to week. It kept the project fresh and spontaneous. Sometimes I’d write a few weeks ahead when I knew there was a thread I wanted to draw out. I had a lot of fun working that way. Lovers in the Garden, the book I just finished for Retrofit Comics, was scripted start to finish before I put pen to paper. And my next book is going to be fully scripted, too. For a graphic novel, in my case, just so I can keep everything straight, and so I can hone dialogue, I really prefer scripting. But the strip form uniquely gave me the freedom to improvise. Every cartoonist has their preferred methods—there’s no right way. As far as character development, all my characters are me. I went to see George Saunders speak and a woman asked him how he was able to write the adolescent girl so well in his short story “Victory Lap,” and he said, “Because she’s me.” I also think about people I know: their mannerisms and speech patterns and personal histories. So all of my characters have elements of friends, acquaintances and myself put in a blender. And I like to drop people into stories as they’re happening. I want people to feel like they’ve been dropped in a world that is fully formed—like the story started before they got there. I think that’s most engaging, most surprising. 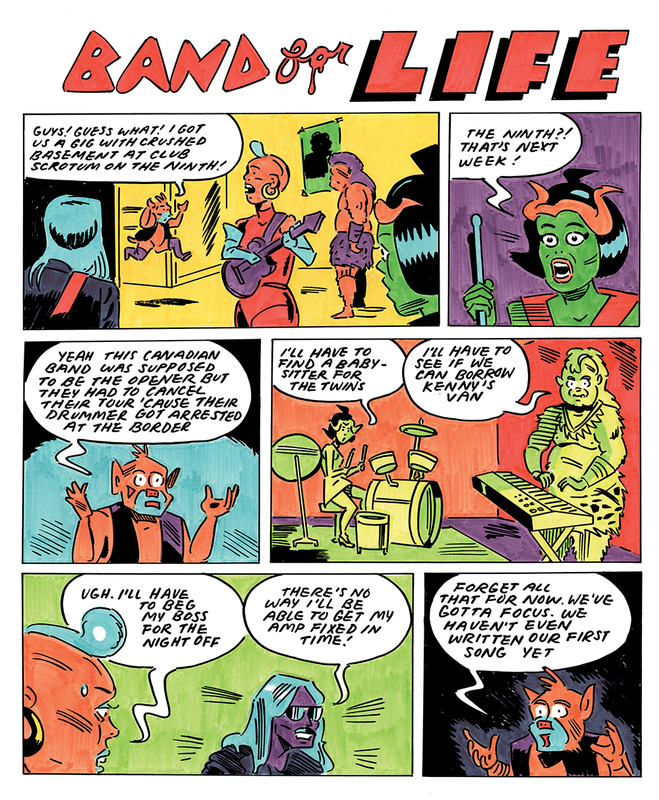 Paste: You’ve always had a ‘70s hard-rock gig poster aesthetic to your coloring, but the palette in Band for Life feels like it’s that turned up to 11—super loud and garish and bold. It’s obviously not a “realistic” color palette; where do the color choices here come from/how do you make them? Davidson: The number one influence on my color choices has always been the CMYK screen-printing process. That stands for cyan, magenta, yellow, key (key is usually black). You print those colors in that order and you can layer them to make secondary colors—green, orange and purple. And even tertiary colors if you want, but I usually stick with those seven colors, with slight variations, no matter what medium I’m coloring in. I love having limitations. It keeps me from being overwhelmed with choices, and it forces me to make weird choices sometimes, which I like. Paste: And do you usually color digitally? The colors on Band for Life almost feel like you did them with felt pens, or those fat Crayola pens—they have this really wonderful lurid texture to them. Davidson: Band for Life is colored with Faber-Castell markers, so yep, they definitely have a lot of texture. I avoid coloring digitally as much as possible, but sometimes it looks best. I try to pick the coloring method that makes the most sense for any given project. I knew coloring Band For Life was going to be a huge amount of work, and I’m able to color more quickly with markers, so that factored into my decision, but I do really love those Faber-Castell colors. Paste: That’s interesting. It’s easy to see why certain palettes may be chosen, but I don’t think I’ve seen many people talking about purposefully choosing certain coloring methods. How do you make that decision about what’s best for the project? Davidson: I think most sane people stick with one coloring method. I’m always wanting to experiment. But I just feel it out. I have a vibe in mind that I want to convey. Like my book Lovers in the Garden is set in ‘70s New York, and it’s kind of a novella, so I thought that would be a good project to try a combination of different types of markers and colored pencils. It has kind of a gritty vibe, and it’s shorter and the original pages are smaller, so I had the luxury of going all out on the hand coloring. If I want something to look slicker, I color it digitally. I’m still working it all out. I probably always will be. Paste: I know you’ve written about comics for The Comics Journal. I know a few cartoonists do it for them, but it’s still uncommon. What compelled you to start doing that? Davidson: Oh man, yeah, so reviewing other peoples’ work is really hard if you’re in the field. I know, for instance, that a lot of famous authors worked as reviewers to help pay the bills, but it’s so hard to write critically about your peers. I use the term peers loosely, because Dan Clowes, who I wrote about, is my better, not my peer. In any case, Dan Nadel asked me, kind of out of the blue, to do some writing and it was a really interesting challenge. Thinking critically about the work of others helps me better articulate my own tastes and goals, and think more critically about my own work. I’ll write more for TCJ if Dan asks me back, but my primary focus is definitely on making my own work, not reviewing other people.